Michael B. Jordan is a huge fan of anime and he has no problem sharing his passion for Japanese animation. Now fans of the Black Panther and Creed star have suggested that he headline a Space Jam remake with anime characters instead of Looney Tunes like the original. Never mind Jordan taking over for NBA legend Michael Jordan, the anime idea is original enough on its own and one could imagine MBJ taking some interest in the proposed role. Space Jam 2 is reportedly still in the works under the direction of Justin Lin, but he might want to rethink what he has in the script at this point. Michael B. Jordan's popularity is soaring right now, thanks to his role as Erik Killmonger in Marvel's Black Panther, which is currently tearing up the worldwide box office. 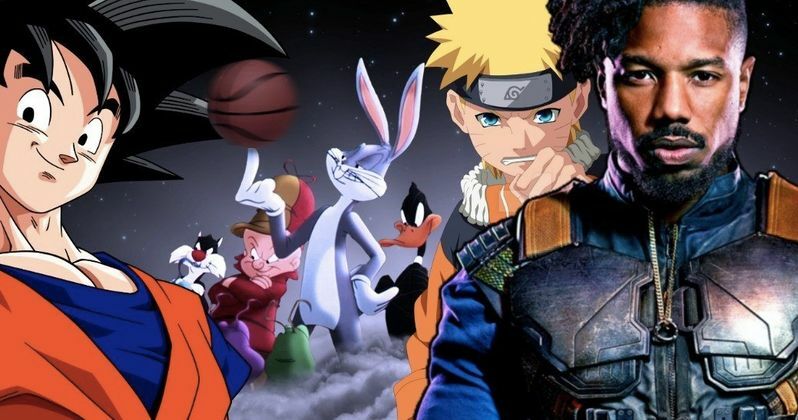 One of Jordan's fans took to Twitter to propose the idea that Warner Bros. ditch their Space Jam 2 plans and instead work on a Space Jam remake starring Michael B. Jordan alongside anime icons. Brentraptor had this to say. "Remake Space Jam but instead of Michael Jordan it's Michael B. Jordan and instead of Looney Tunes it's anime." Normally, this kind of flippant tweet would appear and disappear pretty quickly, but this one has amassed over 28,000 retweets and nearly 100,000 likes. Space Jam fans as well as Jordan and anime fans are taking this pretty seriously with some even joking that Ryan Coogler should direct it. While this more than likely won't happen, it's pretty fun to think about and Michael B. Jordan definitely enjoys the idea of anything involving himself and anime in any capacity. LeBron James' name has been thrown around quite a bit for the sequel to Space Jam, but Michael B. Jordan would probably make a better choice in terms of acting abilities. Additionally, Michael B. Jordan was named after Michael Jordan, so that makes another interesting point why this anime version of the cult favorite movie is a pretty epic idea. The first Space Jam came out in 1996 and starred NBA star Jordan along with Bill Murray and Danny DeVito and a sequel has been talked about for years, with the last few years promising the long-awaited movie. Interestingly, Michael B. Jordan hasn't commented on an anime version of Space Jam with him in the lead role. He's probably busy promoting Black Panther and gearing up for Creed 2, which is scheduled to begin filming in a few months. As far as fan ideas go, this Space Jam remake is pretty amazing and something that Warner Bros. and Justin Lin should take seriously because there is a demand for it, as evidenced by the crazy Twitter thread. You can check out the thread that sparked the whole Space Jam remake below, courtesy of Brentraptor's Twitter account.